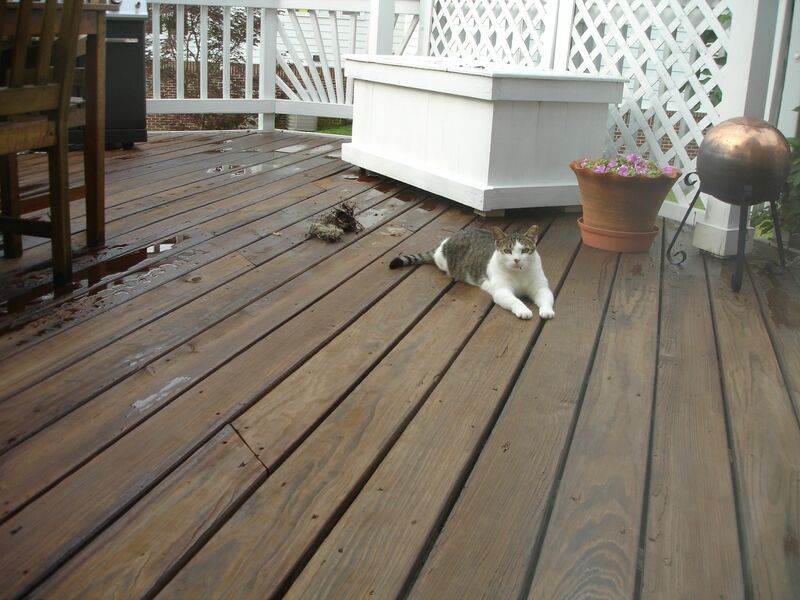 To honor Earth Day, I have some great ways to recycle in the garden that I want to share with you. I will start with some alternative ideas for things that are commonly tossed out. These are easy, but ones that you might not have tried. 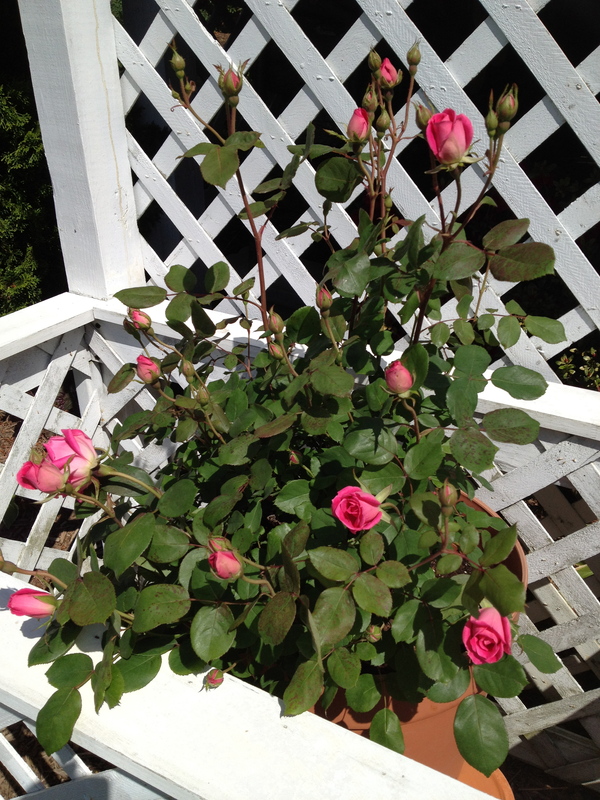 This year I am adding knockout roses to my planters. 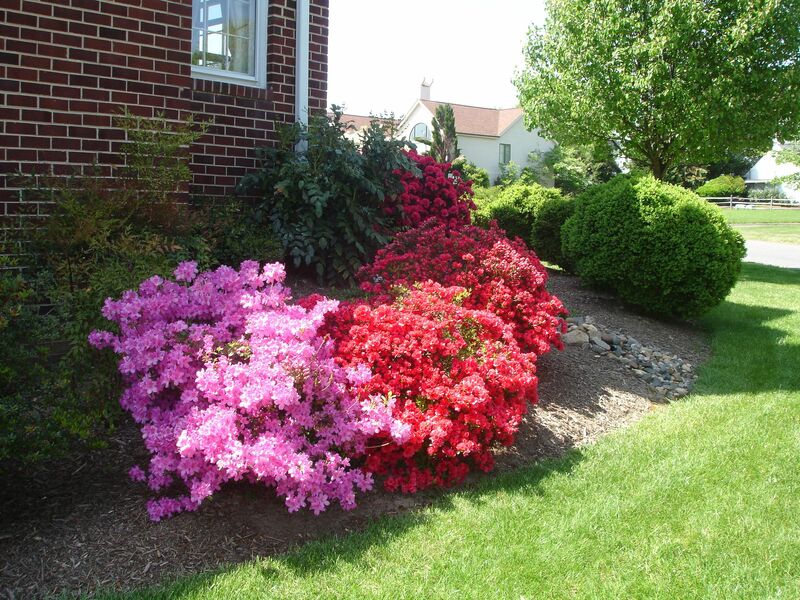 They have a deep root structure, so it's important to have soil amendments like grass clippings or compost, to keep the soil light and nutrient filled. We are still having temperatures in the 40’s overnight, so as the grass gets mowed we are collecting the clippings instead of mulching them. In our yard, this can mean eight or so bags of grass each week. As an alternative to adding them to a compost pile, one of the best nutrients is to incorporate a bag or two of grass clippings for every 3-4 feet of soil. I do this annually where I plant flowers, and it’s great to use in the vegetable garden as well. I add grass clippings to the potting soil to give an extra boost to the roots, and to keep the soil loose. I have even used clippings as mulch in the herb garden in the past, stirring them into the soil every couple of weeks. This provides a constant source of nitrogen for the heavy feeders like tomatoes, too. I dig up river rocks in the garden all the time. 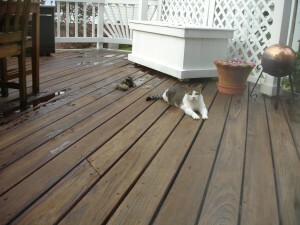 I reuse them by paving the under deck area. They also make great pathways. It seems one of the things that grows best in my garden is river rocks. Really — for every shovel full of soil I dig up at least 2 or 3 potato sized rocks. 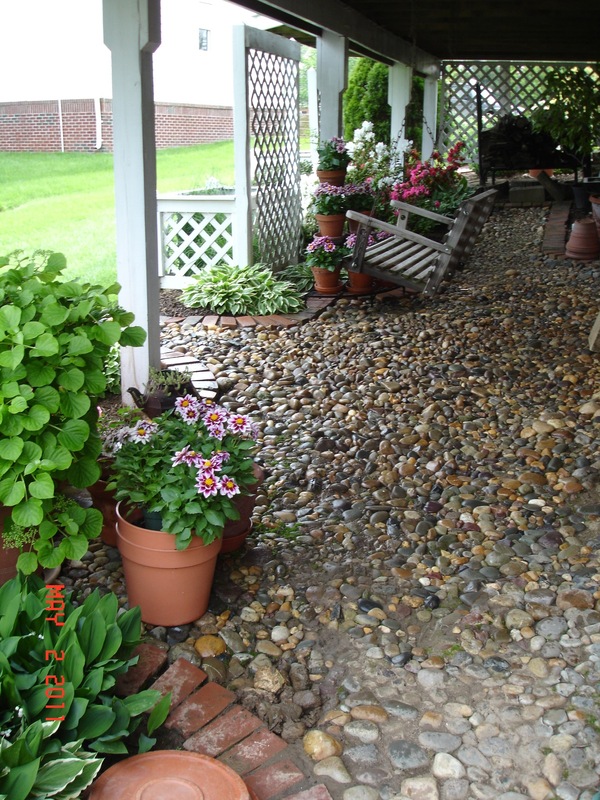 I recycle them by paving the area under my deck with the larger rocks. They have become a wonderful surface which prevents erosion, as well as keeping the area walkable. They make terrific pathway material, or could even become a border around the edge of a bed. Another way I use them in my yard is to disperse the water from the downspouts. I use them in place of the ordinary splash guards made of concrete or plastic. 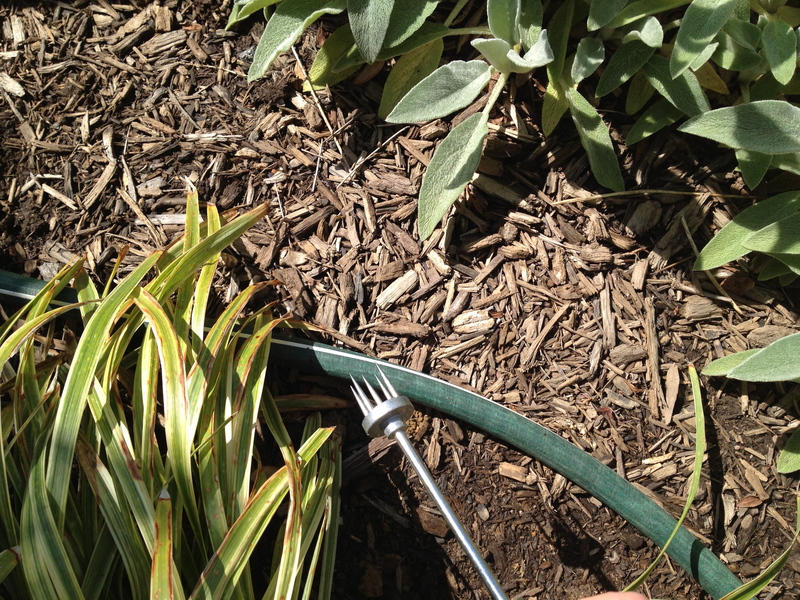 You can make your own "customized" soaker hose by placing it through your garden bed, then puncturing the hose right at the root zone of each plant you want watered. This is a great way to repurpose an old hose that already has pinholes in it. Instead of throwing away those old hoses — you know, the ones with all the pinholes that have developed over time — here is a creative reuse for them. Go ahead and add more. This can easily be done with an ice pick. Add them every few inches, and you will have created your own “soaker” style hose. 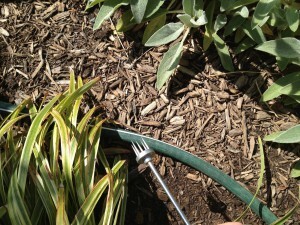 The end of the hose can easily be “plugged” just by leaving an old spray nozzle on it. An even more water efficient method would be to place the hose in the garden and puncture holes into it right at the root zone of each plant you want to water. I like to place mine in the garden before I mulch. Then layer in the mulch on top. You don’t even know the hoses are there. I leave a quick connect on the other end, and just hook it up when needed. (Better for aesthetics!) I love soaker hoses, they are such time savers and so water efficient. For the more advanced recycler, don’t overlook the value of reusing old fencing boards in new projects. Quite often some of the boards are rotten, but not all. We took down an old fence some time ago, and have reused the wood in many of our garden projects. This deck box is one. It houses all of the cushions for the deck chairs when not in use, and keeps them handy when we want them. Just take an inventory of the wood you have on hand, then design your project around it. It’s always fun to have a one of a kind, useful piece of furniture,too! From the same old fence, my tool shed and potting bench were created. As nice as it is to reuse the old boards, it’s also budget friendly. You can’t beat free! Here's another use for rocks from your garden. I use them to channel and disperse the water from the downspouts. It conforms to the terrain better than splash guards, and also does a better job. These recycling ideas are just a few, but they are ones that if the components had been tossed, it would have equaled a huge amount in a landfill. I will list more recycling ideas in the future, but hope you will send your ideas to me. I would love to share them all. If everyone does just one small thing, the impact is great!